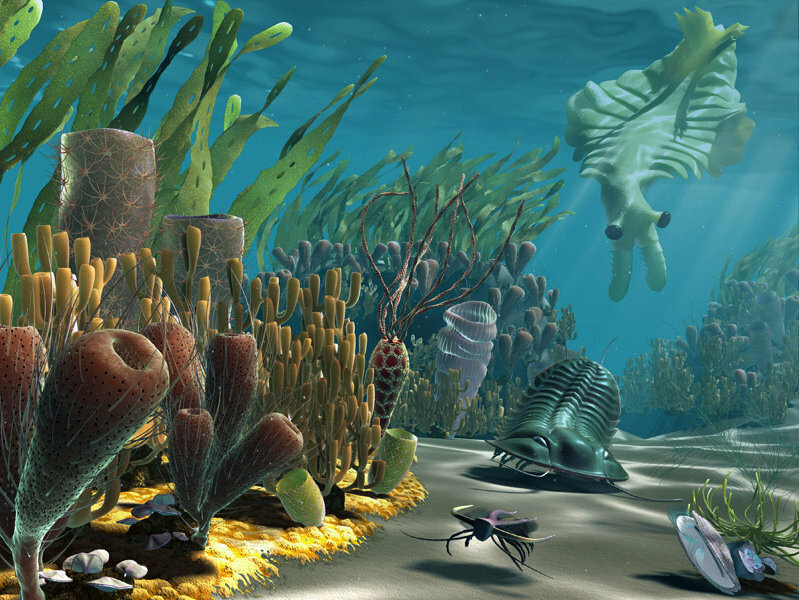 To explore evolutionary adaptations during the Cambrian Period 550 mya. Students will examine how some of the first complex organisms adapted to changes in the environment such as predation, food availabililty, ocean chemistry and others. Students can identify how some of the organisms adapted new behavioral strategies and physical features that enabled them to survive in a changing landscape. In addition, some of our very first ancestors emerged during this fascinating time featuring a notochord or the first backbone. Students will be asked to construct a Cambrian Critter using a variety of suggested materials outlined on the following pages. Students will also examine how their critter responded to changes in the environment while learning more about its behavior, physical specifications, diet, natural enemies as well as the Cambrian ocean ecosystem. This project should encompass approximately two weeks with much of the construction taking place at home. 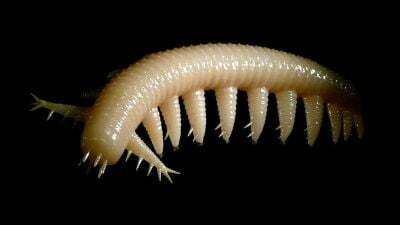 Outlined below is a list of some of those creatures or Cambrian Critters that were featured in David Attenborough's First Life video (BBC/Youtube). This guide will prove useful to you as you learn more about this strange and exciting time in our planet’s history. The spelling and physical description will help you as you research your creature and before engaging in the Cambrian Critter Project. The Trilobite (right) is a familiar Cambrian creature but scientists do not know a great deal about its habits. 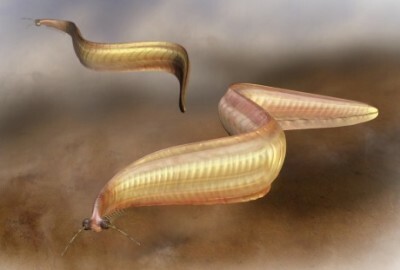 The name 'TRILOBITE' means 'three lobed" and is derived from the fact these animals had bodies featuring three longitudinal lobes, not lateral (head, body, tail) as is often thought. Trilobites are hard-shelled, segmented creatures that lived hundreds of millions of years ago in the Earth's ancient seas. They are considered to be one of our planet's earliest complex life-forms and are one of the key signature creatures of the Paleozoic Era. 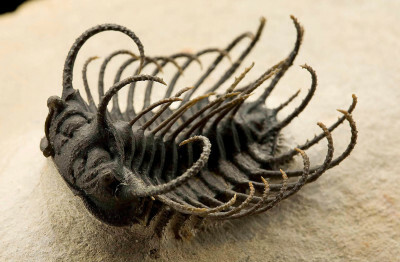 Trilobites went extinct before dinosaurs even existed. 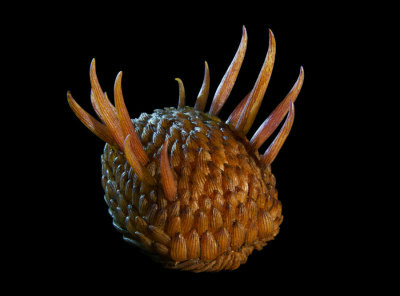 Wiwaxia is an interesting little fellow pictured on the left. It is often described as a prehistoric “pin cushion”. Longer spines project in two rows along the back, and evidently provided some protections against predators. Since there are no spines on the bottom of its ventral surface, the animal partly resembles the slug, a member of the mollusk family. Hallucigenia (right) is appropriately named. This unusual creature has confounded scientists for years. 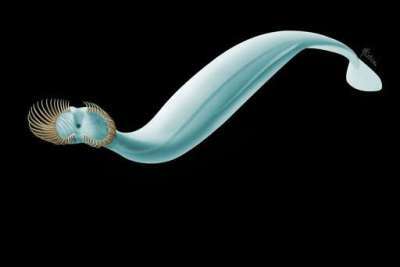 It possesses spines along its back with several pairs of segmented legs to help maneuver along the Cambrian ocean floor. Early fossils made identification of this creature difficult since it was hard to tell the top or bottom of this bizarre fellow. The creature's name suggests that it might have been the product of a wild imagination or hallucination. 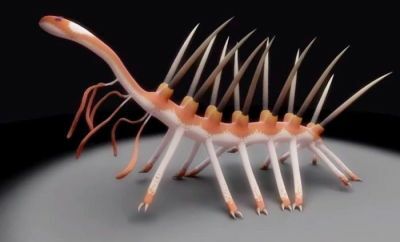 Initially scientists believed that its spines were a response to the arrival of Anomalocaris and were used as an effective defensive weapon. 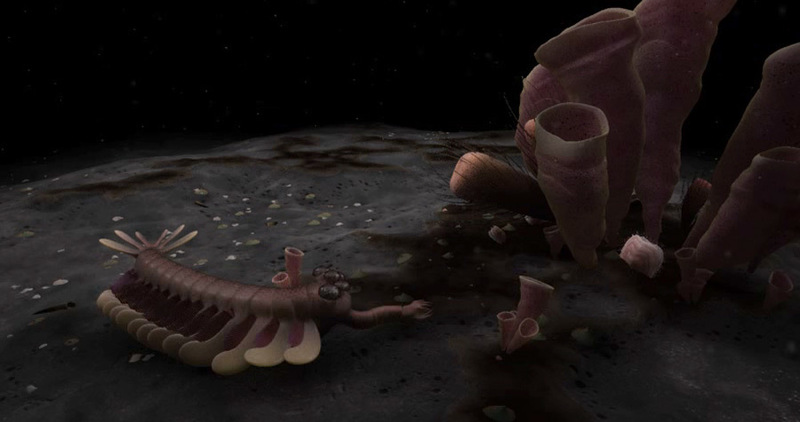 Anomalocaris is the “bad boy” of the Cambrian epoch and is pictured on the left. Measuring 2-3 meters long with two long spiked appendages used for grasping its prey. A circular mouth underneath its head facilitated the chewing of its food. Its tail features two pairs of long spines while its flattened body undulates like a sting- ray to make it an efficient swimmer and hunter. The creature featured two large eyes on stalks were apparently all anomalocaris needed to spot its next meal. 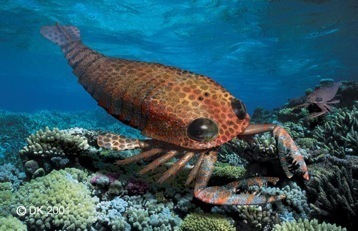 The emergence of Anomalocaris is particularly significant because it was the first true predator in the Cambrian ocean. Its arrival forced creatures to adapt to this dramatic and deadly change in their environment or else they would be eaten. 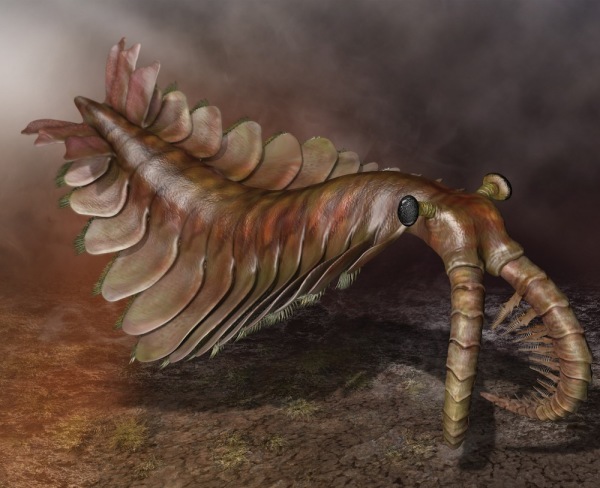 Creatures adapted in many unique ways and the arrivale of Anomalocaris is considered to be one of the greatest evolutionary events during this period. Pikaia (right) is a very important creature in our study of early life forms and body structures. Although at first glance it appears to closely resemble a sea snake with a flattened tail, elongated body and small head. However, Pikaia has a notochord which is a long, ribbon like organ made from cartilage. It represents the first backbone and possibly the first creature with a backbone. This would mean that Pikaia could easily be our earliest ancestor- a vertebrate. Pterygotus on the left means “winged animal” or “finned one” was one of the largest member of the arthropod family. It is directly related to the sea scorpion which are the ancestors to modern day scorpions. This creature was a swimmer but had a segmented body with jointed pincers or claws. It had two large compound eyes with two smaller eyes in the center of its head. Pterygotus may have reached a length of over seven feet which made it one of the largest inhabitants of the Cambrian period. Scientists believe that this creature may have appeared during the Silurian period and died off in the Devonian. It was clearly a fierce predator and an effective hunter to say the least.